Web Site for a special preview! 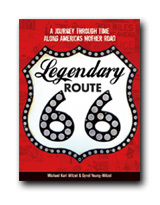 Legendary Route 66: A Journey Through Time Along America's Mother Road is an amazing homage to this historic highway. Through an eye-popping collection of color and black and white images, follow the evolution of Route 66 from the early days of the trails to the era of the superhighway bypass. Along the way, you'll meet the legends that breathed life into the road and will discover why this fabled highway is more than just a road. Experience the sights along the way with historic and current photos in then-and-now pairings, vintage postcards, road signs, trinkets, maps, brochures, and ads. Witzel shares a wealth of personal, archive, collector, and contributing photographer images in these pages, offering a nostalgic tour of the charms and oddities of this road through American cultural history. 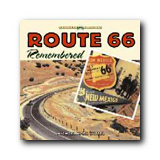 Route 66 Remembered is an incredible collection of historical photographs and evocative interviews that capture the reverence of the towns and attractions found along the roadsides of America's fabled Mother Road, Route 66. Take a nostalgic time trip from Chicago, Illinois to Santa Monica, California across a long-forgotten America of yesteryear and rediscover the myth, magic, and imagination that defines the “old road.” Inside, you'll discover the wonder of roadside attractions and tourist traps, greasy spoon diners and restaurants, service stations, tourist courts, auto camps, and motels that transformed the highway into a living, breathing entity. 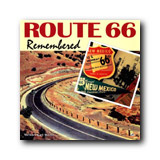 On Route 66—the legendary Main Street of America—the ride truly is more important than the destination.